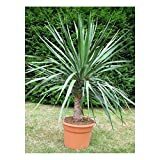 Dragon tree growing succulent tree of the genus Dracaena also known as Dracaena draco or Dracaena dragon, Dragon tree perennial evergreen used as ornamental plant, can grow in mediterranean, desert or subtropics climate and growing in hardiness zone 10+. Leaves color green grayish, the leaves like spear with pointed top, leaves grow in rosette structure. Flower color white small and grow on stems in inflorescence, flower bloom after 10-15 years and the stem die after the bloom. Organic Flower seeds Dracaena "Dragon-Tree" (Dracaena draco). Plant indoor. White small and grow on stems in inflorescence, flower bloom after 10-15 years and the stem die after the bloom.